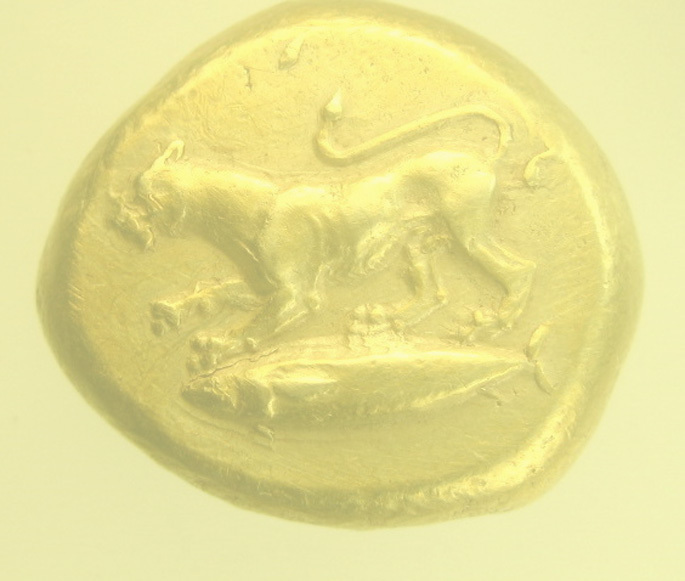 Coinage was invented in the seventh century BCE in the Black Sea region northeast of Greece, where the alluvial flow of gold and silver mixed together yeilded the metal known as electrum. Gold and Silver had been used by the earliest Egyptian and Mesopotamian civilizations as a store of wealth, and a medium of trade. 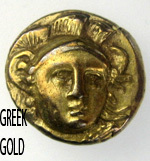 But this naturally occuring electrum was first coined by the kings of Lydia, Miletos, Ephesos, Phokia, and then Lesbos and Kyzykos. These coins undoubtedly were responsible for a boom in trade both between city-states, and in the rapid escalation of local markets. Herodutus famously refered to the Lydians as a nation of shopkeepers. The largest unit of trade was the "Stater" which was a translation of the semitic "Shekel," a unit of weight used in the semitic East. Weights varied from between 14 and 16 grams according to local standards. These staters were broken down into trites (thirds) hektes (sixths) and various smaller units. Croesus of Lydia was the first king to separate the electrum to issue gold and silver coins circa 545 BCE. He was conquered by Darios of Persia who issued his own gold and silver coinage. Coinage spread quickly in the early fifth century BCE through the Greek city states. Most of the trade coinage was silver, while gold was most often reserved for emergency issues associated with war. Solon of Athens is credited as the man who not only codified the laws the governed Athenian Democracy but also introduced coinage from the Black Sea Area. It is said that he visited the court of Croesus, where Croesus asked him who the happiest man on earth must be. When Solon told him it was Tellus of Athens, a man governed in all things by the Athenian ideal of perfect moderation, Croesus banished Solon from Lydia. A short time later, when Croesus was conquered by Darios and about to be put to death he exclaimed: "If I had only listened to Solon!"